Wipe both sides of the banana leaves with damp towel. The shiny side should be facing you. Cut it into a size that will fit on a serving plate (as shown in photo). Scoop about 1 cup of rice on the banana leaves. 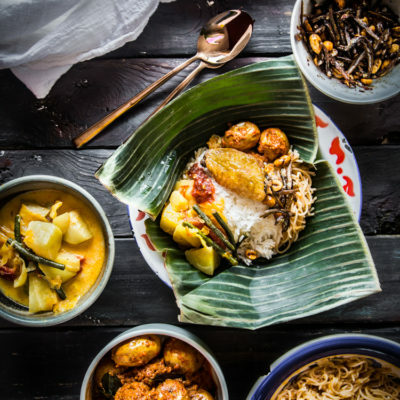 Take about 1 to 2 potato rendang, 1 to 2 spoonful of stir-fried bee hoon, sprinkle of sambal anchovies with peanuts, fried chicken, ladle some of the veggies from sayur lodeh and some of the broth over the rice. A small/big scoop of spicy sambal on the side and you are ready to tuck in !